Some say that looking at beauty in the world, is the first step of purifying the mind. On February 26 you will have a chance to witness one of many beauty’s that earth can offer - Annular Solar Eclipse. Many have heard of this phenomena before, but not actually everyone knows what this means and how can this be explained. 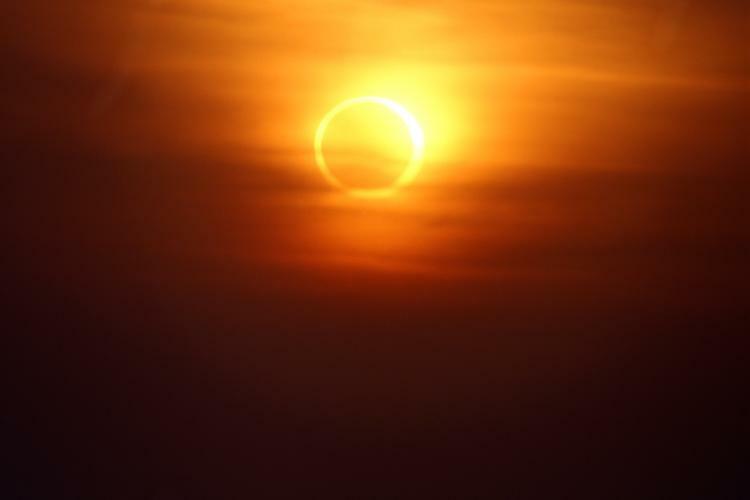 An annular solar eclipse occurs when the Moon is too far away from the Earth to completely cover the Sun. This results in a ring of light around the darkened Moon. The Sun's corona is not visible during an annular eclipse, which means that the sun disappears for a certain period of time. This type of eclipse is a called an “annular” eclipse. It comes from the Latin word “annulus” which means “ring”.The path of the eclipse will begin off the coast of Chile and pass through southern Chile and southern Argentina, across the southern Atlantic Ocean, and into Angola and Congo in Africa. A partial eclipse will be visible throughout parts of southern South America and southwestern Africa. A total solar eclipse can happen once every 1-2 years so don’t wait until the next one, witness this one! Throughout every lunar month, the distance between our planet and the Moon varies because the shape of the Moon's orbit around Earth is elliptical, rather than circular. The reason we can see the glowing outer edge of the Sun at the maximum point of an annular eclipse is that it happens while the Moon is near its farthest point from Earth, called apogee, when the Moon is smaller than the Sun when viewed from Earth. Annular eclipses can last over 3 hours in locations where annularity is visible. From start to finish, the total duration of annular eclipses can be over 6 hours but not in a single location. The annularity, when only a ring of fire is visible in the sky, can range from less than a second to over 12 minutes. Earth's orbit around the Sun is also elliptical, which means that there is 1 point of the path when Earth is at its closest point to the Sun (perihelion) and 1 point when it is furthest away (aphelion). Earth's distance to the Sun also sometimes affects the type of eclipse, the duration of the eclipse, exactly how much of the Sun's disk will be eclipsed, and the size of the area on Earth where the eclipse is visible. Name a star to not only look for Annular solar eclipse but also for your own named star. Naming a star as such is a great way of honouring someone, still watching the stars definitely is a perfect gift to give while watching the spectacular nature thing of beauty called Annular Solar Eclipse. Safety is first, so here is a couple of tips for those eager not to miss the solar eclipse. Never look at the Sun, eclipsed or otherwise, without proper eye protection, like eclipse glasses. The Sun’s rays can burn the retinas in the eyes leading to permanent damage or even blindness. A safe way to watch a solar eclipse is to wear protective eclipse glasses or to project an image of the eclipsed Sun using a pinhole projector.